A man is detained on suspicion of having links to a gang, San Juan Opico, El Salvador, April 1, 2015 (AP photo by Salvador Melendez). SAN SALVADOR—Late one morning in the fall of 2016, police officers handcuffed a group of middle school-aged boys on a street in a neighborhood on the outskirts of El Salvador’s capital. The boys were serving as lookouts for members of MS-13, or Mara Salvatrucha, the violent street gang that originated in Los Angeles and expanded over two decades ago to this small Central American country, which had just ended a brutal civil war. MS-13 and other gangs have since multiplied across El Salvador, becoming a main source of violence in the postwar era. There are now an estimated 60,000 gang members in a country of 6.5 million people. Serving as lookouts, as the boys were doing, is an early step toward full gang membership. After handcuffing them, the police officers commandeered a nearby home, forcing the family out, then took the boys inside and onto the back patio. The officers proceeded to torture and kill them; it took several hours. The coroner’s report notes that one boy’s body featured a trail of bullet wounds leading from his left wrist to his forehead. Neighbors later said they could hear the boys pleading for their lives as the officers laughed. Yet the internal police report, which I’ve reviewed, lays out a different scenario. It says a confidential informant called the police to report that MS-13 members were gathered on a corner, and that when the police arrived, a shoot-out ensued. It describes the operation as an “achievement obtained” and states—falsely, according to witnesses—that the boys were killed in the exchange of gunfire. Such incidents are all too common in El Salvador, where there is an alarming pattern of escalating police violence. The Salvadoran National Civil Police, known by its Spanish initials, PNC, often uses the term enfrentamiento, meaning “shoot-out,” to explain police killings of young people suspected of gang membership. The number of so-called enfrentamientos jumped from 39 in 2013 to 591 in 2016, after Mauricio Landaverde, the director of the PNC at the time, announced that officers would face no consequences for shooting suspected gang members. But as was true in the case of the boys’ killings, these often aren’t shoot-outs at all. Police violence also occurs in other, equally grisly, forms. Local press outlets have managed to infiltrate WhatsApp networks the police use to plan murders, torture and rapes. Salvadoran journalists have also proven multiple cases of extrajudicial killings that were originally reported as shoot-outs. When confronted with these cases, the PNC disputes their details, but it makes no apologies for its zero-tolerance policy toward gangs. Like MS-13 itself, this policy, known as mano dura, or iron fist, has roots in the United States, having been modeled on crime-fighting tactics championed by American politicians and law-enforcement officials. 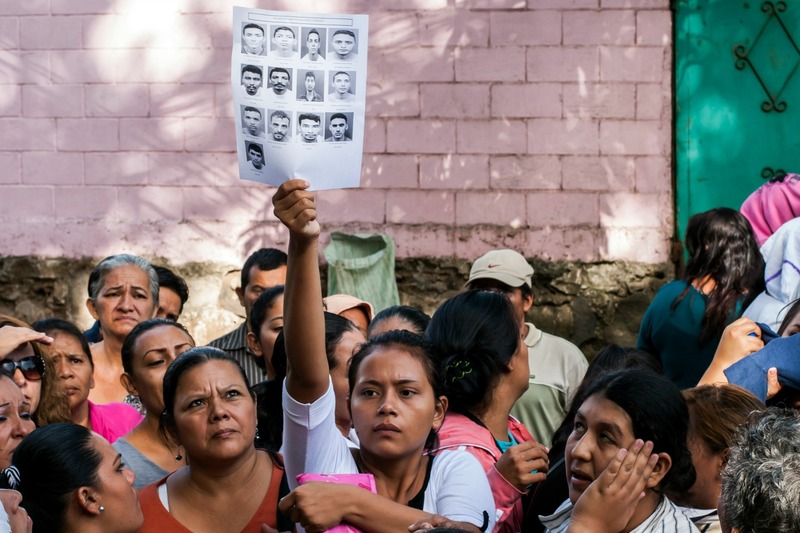 The policy was first introduced in El Salvador in 2003 and has since evolved, taking a particularly gruesome turn after 2015, in the wake of Landaverde’s announcement. This trend was reinforced by the current government’s adoption in April 2016 of a security policy known as Extraordinary Measures, which keeps prisons holding suspected gang members on lockdown. In 2016 and again in 2017, the Washington-based Inter-American Commission on Human Rights said the available evidence suggested that enfrentamientos amounted to systematic extrajudicial killings. In 2017, the United Nations asked the Salvadoran government, which has been controlled by the leftist Farabundo Marti National Liberation Front, or FMLN, since 2009, to discontinue Extraordinary Measures—a recommendation that Landaverde, now the minister of justice and security, says was “based on falsehoods.” Also last year, in its first report on El Salvador, the International Crisis Group declared that mano dura had been a failure. Yet the government is doubling down, and now seeks to renew Extraordinary Measures for another year. For the families of Salvadorans killed by the police, what comes next can be just as terrifying. Mano dura was adopted in 2003 under El Salvador’s then-president, Francisco Flores, who came to power in 1999. More than a decade had passed since the end of the Salvadoran Civil War, a 12-year conflict in which more than 75,000 people died. The policy was adopted even though the murder rate had steadily fallen throughout the postwar years, from 6,792 murders in 1996 to 2,388 murders in 2003. At first, mano dura wasn’t even a formal policy; it was a memo to the police. The memo instructed them to use any means at their disposal to incarcerate and disband the nascent gangs, and to work with the army and attorney general in doing so, according to an October 2017 report by analyst Veronica Reyna for the German political foundation Friedrich Ebert Stiftung. Public policies usually feature concrete goals, defined timelines and ways to measure success. Mano dura had none of these, Reyna’s report notes. After sending off the memo, the Flores administration began successfully lobbying for anti-gang laws to grant mano dura judicial legitimacy. These laws defined gang members by their clothing or tattoos, allowed for mass arrests, reduced police oversight and made combating gang activity a top judicial and police priority. Another crucial element of mano dura’s implementation was generating media coverage that would prime Salvadorans for the crackdown to come. The goal seemed to be to convince the population that gangs posed a singular threat to security. This coverage had the added benefit of distracting from economic and social problems and other types of crime. In the first 13 months that mano dura was in effect, the police arrested 19,275 people for alleged gang membership, according to Reyna’s report. Of those, 17,540 were almost immediately freed for lack of evidence. Many of them weren’t gang members; they simply came from poor communities where the authorities suspected that gangs existed. But once arrested, they were cycled through holding cells with actual gang members, and some chose to join gangs as a result. El Salvador, Aug. 23, 2015 (AP photo by Salvador Melendez). These mass arrests were carried out in lieu of tactics that would actually address the systemic causes of persistent violence in El Salvador—a problem that was much bigger than the gangs. The police force even called attention to this fact early on. A November 2004 report from the PNC’s Division of Youth and Family Services defined violence as a matter of public health, and took issue with the idea that the police should be the sole institution in charge of public security. It also identified additional drivers of violence in El Salvador, none of which mano dura did anything to combat: the widespread availability of guns, drug and alcohol abuse, the legacy of the war years and social problems like family disintegration. “I look at this and I think, Where did you all lose your way?” a Salvadoran police officer told me last August during an interview at a café in San Salvador. The officer, who insisted on anonymity so he could speak freely about the policy, said he was especially disturbed by the similarities between tactics employed by police implementing mano dura and those of state security forces during the civil war, which sponsored death squads and were notorious for their widespread use of torture. Given both mano dura’s ineffectiveness and the social harm it caused, the government’s commitment to it was puzzling, perhaps. But shortly after the policy was put in place, the leak of an internal memo from the leadership of Flores’ political party, the right-wing Nationalist Republican Alliance, or ARENA, shed some light on officials’ motivations. The purpose of mano dura, the memo stated, was simple: to win the upcoming 2004 presidential elections. Since assuming office in 1999, Flores hadn’t made significant strides on his proposed economic improvements, so the party didn’t have much to rally around. It had also suffered a poor showing in mid-term legislative elections in 2003, underscoring the need for a visible win. As a political tool, mano dura was wildly successful. It worked by constructing the image of a common enemy—gangs—that both the government and the public could rally against. And it convinced voters that ARENA was the one force capable of vanquishing that enemy. ARENA won the 2004 presidential elections, allowing Antonio Saca to succeed Flores, who was not able to run for re-election because Salvadoran presidents cannot serve consecutive terms. Shortly after taking office, Saca introduced a new security policy known as “Super Mano Dura.” It was the first sign that a pattern was emerging: Every administration since Flores’ has embraced some form of mano dura, in substance if not in name. The rhetoric that took root in El Salvador around suspected gang members harkens back to moral panics around crime in the United States. The obsessive focus on the gangs as the focal point of societal ills recalls alarm over “squeegee men” in New York City under former Mayor Rudolph Giuliani or the “super-predators” that Hillary Clinton infamously warned about as first lady in the 1990s. Aided by the media, Salvadoran authorities have convinced much of the country that gangs are the biggest threat it faces. Identifying particular groups as representing a paramount threat, and then arguing that special policing and judicial policies are necessary to protect the public from them, is the same approach that led the U.S. to adopt zero-tolerance policies and “broken windows” policing more than a decade before they appeared in El Salvador. Whereas zero-tolerance policies involved frequent arrests and long prison sentences, “broken windows” referred to the aggressive prosecution of minor infractions that were believed to be gateways to violent crimes. Both ruined relationships between communities and the state and resulted in overcrowded prisons. 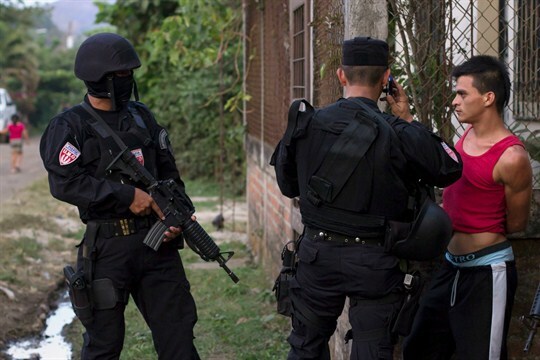 Over the years, various journalists and researchers have established more explicit links between American and Salvadoran approaches to fighting crime. For example, Jose Miguel Cruz, a Salvadoran political scientist who has been tracking approaches to gang violence in both countries for more than two decades, has written that El Salvador’s anti-gang laws were “inspired by the zero tolerance policy—oriented more toward penalizing wrong than preventing it—that had been implemented in several North American Cities” like New York and Los Angeles. Those who lived in Los Angeles during the heyday of America’s embrace of zero tolerance and broken windows policing know its harmful effects all too well. Carmelo Alvarez, an L.A. native, saw how the policies contributed both directly and indirectly to the problems El Salvador faces today. In the early 1980s, Alvarez founded Radiotron, one of the first hip-hop clubs on the West Coast. He grew Radiotron into an ad-hoc community center that taught breakdancing, graffiti, rapping and a host of other undeniably cool, competitive group pastimes that kept kids from joining gangs, and even got some who had already joined to leave. About half of his kids were Salvadoran war refugees, he estimates. Alvarez also taught a course on human rights and cultural sensitivity to officers from the Los Angeles Police Department. In the 1990s, Alvarez watched as LAPD officers conducted mass sweeps in areas of the city where gangs held territory, often interrupting his programming to line up, interrogate and beat his kids. “The story was: Salvadoran kids fled war to get beat up by cops,” he told me when we met at an IHOP in L.A. Sometimes Alvarez himself was forced to his knees and searched after officers stormed Radiotron. Yet some American policymakers continue to tout zero-tolerance policing. One of its most visible advocates, Giuliani, who built his political career on it, also helped legitimize the approach in El Salvador. The year after completing his final term as New York’s mayor in 2001, he founded a global security consulting firm, Giuliani Partners LLC. In 2015, after being hired as a consultant by a conservative alliance of private firms in El Salvador, he came to the country and announced that he had a recipe to keep its citizens safe. “These two gangs need to be annihilated,” he said, referring to MS-13 and the two factions that make up its main rival, Barrio 18 Surenos and Barrio 18 Revolucionarios. Salvadoran journalist Gabriel Labrador noted at the time that Giuliani made statements and offered ideas that echoed the security plans and strategies that were already being implemented. One of the architects of mano dura in El Salvador, Francisco Bertrand Galindo, who was the minister of security when it was first implemented, told Labrador that Giuliani had come to bolster support for what was in place. San Salvador, El Salvador, July 27, 2017 (AP photo by Pablo Martinez Monsivais). With Donald Trump in the White House, Salvadoran authorities are receiving even more encouragement from the U.S. to continue with mano dura. “Let me state this clearly,” Attorney General Jeff Sessions said last April. “Under President Trump, the Justice Department has zero tolerance for gang violence.” Three months later, Sessions traveled to El Salvador to applaud the anti-gang work of his Salvadoran counterparts, calling a recent mass raid of suspected gang members an “inspiration.” In meetings with President Salvador Sanchez Ceren and Attorney General Douglas Melendez, Sessions reportedly asked the leaders to “place an emphasis” on combating gangs. 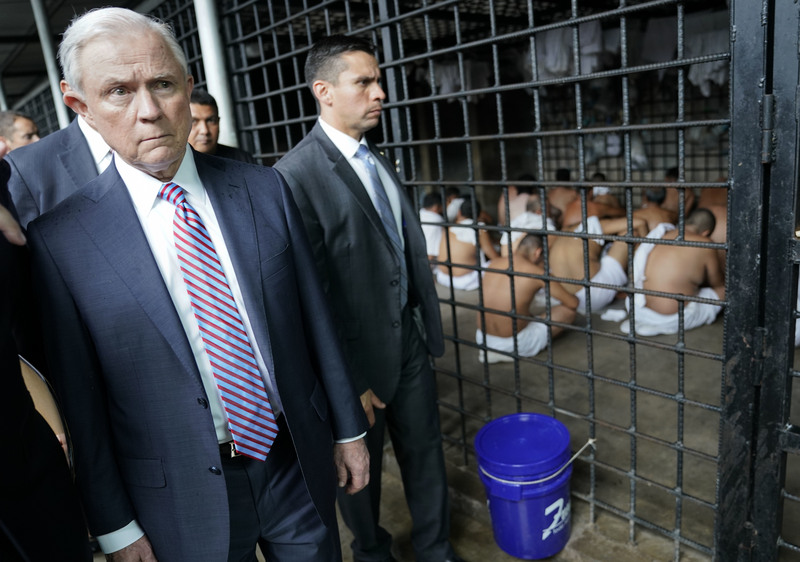 While Sessions was in El Salvador, Trump went to Long Island, New York, where he proclaimed in a speech that members of MS-13 are “animals” and that the gang is fed by undocumented migrants who come to the U.S. fleeing violence in Central America, an argument he later repeated in his 2018 State of the Union speech. Salvadoran journalist Oscar Martinez, who went to Long Island shortly after Trump did, said history is repeating itself: Zero-tolerance policies in America are criminalizing young Salvadoran immigrants, resulting in deportations and a repressive atmosphere that fuels gang recruitment. The Trump administration is implementing the same tactics that gave rise to the gang problem in El Salvador in the first place. Since the implementation of mano dura, violence in El Salvador has skyrocketed, and the country has become the homicide capital of the world. In 2015, according to Reyna’s report, the total number of murders reached a high of 6,657; in 2016, it fell slightly, to 5,278. Gangs are also targeting police officers and their families with increasing frequency. In 2014, more than 30 police officers were killed. That number doubled in 2015, and 20 soldiers, who patrol the streets alongside police officers, were also killed. Yet few politicians in El Salvador have taken a public stance against mano dura. Parties on both the right and the left continue to profess faith in zero tolerance. These statements, however, are insincere, as these same politicians have also used the gangs as machines to get votes. Court testimony and leaked audio and video have implicated both ARENA and the FMLN in arrangements in which they promise gang leaders favors in exchange for their support. Gangs, after all, hold sway over thousands of citizens, and winning gang support can be an effective political strategy. Those who denounce the dark side of mano dura are frequently accused of supporting gangs. Those who denounce the dark side of mano dura and keep records of extrajudicial murders are frequently accused of supporting gangs. The few lawyers, journalists and human rights advocates in the country willing to document government abuse strongly suspect they are the targets of unauthorized electronic surveillance by the intelligence services, which sometimes they are able to prove. In a society that has been sold the benefits of mano dura for more than a decade, many Salvadorans equate police brutality with public safety. A 2017 study on citizen confidence in the police, published by the University of Central America in San Salvador and Florida International University, found that 40 percent of respondents supported torture against people involved in organized crime, and 40 percent also approved of police breaking the law if necessary when capturing criminals. But El Salvador’s gangs are arguably stronger than ever. According to a 2017 study published by Florida International University, young people say they join gangs for the same reasons they did more than 20 years ago: domestic violence, lack of education, limited employment opportunities and rundown neighborhoods, among other economic and social problems. Mano dura ignores all of that. Danielle Mackey is a journalist based in El Salvador and New York. She is a senior fellow at the Schuster Institute for Investigative Journalism at Brandeis University, and is a part-time staff member of the research teams at The Intercept and Field of Vision. More of her work is available here. Reporting for this story was made possible by a grant from Fund for Investigative Journalism and a fellowship from the Schuster Institute for Investigative Journalism, with support from the Ford Foundation.